I dunno, I can't point to one thing. I was born between Star wars and Empire so it has always been there for me. I had a Luke Skywalker pilot Halloween costume and using my dads tape measure like a lightsaber is one of my earliest memories. I have been in the 501st for a few years now as a biker scout and am building an astromech in my garage so I am in for life now I guess. Sweet! I've love to see pics of your armor and droid sometime. This is mostly cut-n-paste from another post I made recently at Beggar's Canyon. Basically, I was first exposed to Star Tours and Ewok movies, then recorded TV broadcasts of Jedi, then Empire, then Star Wars—so really I worked my way backwards. I think for my age group that wasn't necessarily unusual. I was born '84, almost exactly in the middle between Jedi's theatrical release and the TV broadcast of Caravan of Courage, so my formative years were squarely in the 'interim' period between Star Wars Mania and the 90s revival. My first exposure to Star Wars was very young, age 2-3, and by 4 I was hooked. First it was taped TV broadcasts of the Ewok movies, which I'd also occasionally catch airing on TV throughout the next 4 or so years. I'm told I also watched a few shows of the Droids & Ewoks cartoons, but I don't remember ever watching them or even knowing they existed until much later, with the help of DVDs and the internet. I was raised basically next door to Disneyland, and as a newly minted 3-year-old I was just at the height requirement to go on the brand new Star Tours ride. Disneyland, and Tomorrowland in particular, formed a HUGE part of my childhood, and it was basically Star Tours and Captain EO that really unlocked my imagination and got me hooked on Lucasfilm. In 1989 my parents recorded the Jedi TV network premiere, right around my birthday, and for a while that was the only actual Star Wars movie I ever saw (probably a few months, which as a 5-year-old feels like a lifetime). It had to have been later that summer when I discovered a taped VHS of Empire in the back of the TV cupboard, and the thought of watching another Star Wars movie completely blew me away. For the longest time I was obsessed with snow and snowspeeders. So my earliest impressions were a mixture of Star Tours, Ewok movies, Empire & Jedi, and another Disneyland attraction: Captain EO. I was probably 5 or 6 before I realized that Captain EO wasn't set in the Star Wars universe, and even then I would still get mixed up over which scene or character was in which movie. At age 7 or 8 I finally had the chance to watch the original Star Wars when my parents rented it for us to watch. By then I knew that there was an 'original Star Wars movie', and it felt really old school to finally get a chance to see it. It looked different, felt different, the characters were all younger and meeting each other for the first time and had different personalities, Obi-Wan Kenobi was alive, Yoda wasn't in the picture yet, and there was this whole story that was completely new to me—plus there was another Death Star, and I was completely thrown back by its weird ball shape! I had NO IDEA that the Death Star in Jedi wasn't actually supposed to look like a grinning skull, and I had an uncomfortable paradigm shift when I realized that the grinning skull wasn't its actual shape, it was only half constructed. The rest of the 90s was spent diving headlong into everything I could get my hands on related to Star Wars. I had a subscription to the Insider, stickers all over my room, toys everywhere, models scattered about that I never seemed to finish (in those days you could get them about as cheap as action figures, back when all drug stores still had a modelling aisle next to the toy aisle). My prize possession was a 1987 Star Tours promo poster framed and hanging over my bed, which I had picked out before I had ever even been on the ride. My first RPG book purchase was Star Wars 2nd edition revised & expanded, apparently right when it hit the shelves in August '96. My friend bought a copy the day it came in and brought it to church that Sunday, and 2 weeks later I had my own. We had already spent several years playing RPGs in one form or another without realizing it—I was a big fan of text adventures and would draw 'Zork maps' on graph paper, then have my friends explore them—and the Star Wars RPG put all of that into perspective for me. It was that golden thread that tied together all of my video games, board games, movies, books, free-form Star Wars RP community boards on AOL, and my silly graph paper maps; and the dice were the key that unlocked it all. The realization that I could use that one book to play anything I wanted, with nothing but dice to replicate the rules, hit me like a ton of bricks. Aside from playing actual Star Wars, I methodically went through every game, movie and book I could think of and created house rules for playing them as an RPG using the Star Wars D6 system: of the top of my head, I remember conversions for Final Fantasy, Chrono Trigger, Mega Man, Star Flight, Shadowrun (the video game, I had no idea there was already an RPG), Middle-earth, WarCraft, Pokemon, Indiana Jones, westerns, and WW2. Most I never played, but I did play a few, particularly a WarCraft game I ran on AOL for a little while. Here ya go, figured you might like something different. 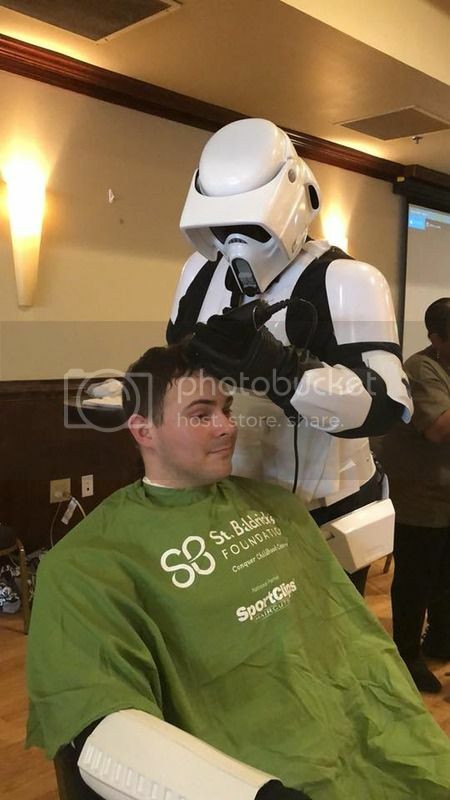 Here I am giving a Stormtrooper a haircut for charity. The astromech isn't ready for prime time just yet but soon I hope. For me it was when my Mom took me to see Star Wars in '77. I still remember the opening crawl (I had to go see it again to read all the words) and then that star destroyer thundered across the screen. I was hooked! Here's my 501st snowie. I was living in North Dakota at the time so it seemed appropriate. Snowie+Texas heat=you are a bold one. You'd be surprised. I got shut down by snow in my big rig in Texas one winter. It was cold enough that day I wouldn't've minded a snowtrooper suit in the slightest. I don't miss the North Texas/Panhandle winters either. The duster is wool and the boots are surplus Canadian Army mukluks, so it's VERY warm. I comfortably strolled in sub-zero temps back in my northern exile days. Of course now that I'm back on the Gulf Coast, it's way too hot to troop in. Mukluks are a thing? I tried to find a youtube clip of Krusty the Clown saying words that sound dirty (like mukluk!) but, alas, I was unable to find it. I also fondly recall introducing my son to Star Wars. He knew about "Darf Vader" before age 3. Later, we had "lightsaber duels" with red and blue plastic fly swatters (he wasn't big enough to handle the Hasbro sabers yet). Sometimes he would use a baby blanket as an improvised robe and wiggle his fingers as "Force Lightning". Being a child in the 80's, I had an older brother that was into it. So it was just always around like baseball or something. As a kid, I saw the OT(that we had recorded on VCR) many times as a kid, and then watched the prequels in the movies with my father. At some point during the prequel era the museum connected to our area's largest movie theater had a Star Wars exhibition, and I went there with my father, and was blow away. Among things, there where Anakin's podracer, royal guard/stromtroopers and an many cool things. I even got a small stick that the guide said is one of the "audience" from Ep.I's podracing scenes. The stadium shown in Ep.I was partially CGI, but mostly a miniature and several thousands sticks of multiple colors, that moved around by an hairdryer to simulate movement. So if true, I own a piece of SW memorabilia that was (barely) seen in Ep.I.